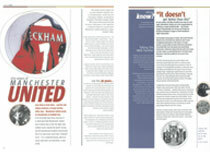 An incredibly popular special edition magazine on Technology and Sport, aimed at Sun’s customers and business contacts. Content made interesting by focusing on the theme of sport and the role that technology has played in it. Also leveraged Sun’s sponsorship of three leading sports teams: McLaren F1, Manchester United and round-the-world sailor Pete Goss, showing how they gain competitive advantage through the use of Sun technology.